We hear all the time that a dog or cat is gaining weight because of being spayed or neutered. While it’s true that a pet’s metabolism decreases after sexual alteration, activity level may go down as well. Not making appropriate adjustments to nutrition and exercise after the surgery can put pets at risk for weight gain over time. Decreasing calories by 10-15% after surgery and watching body condition score closely can effectively ward off this detrimental change. Like in so many other areas of life, cats have to make everything a little more difficult. It is absolutely true that cats shouldn’t lose weight too quickly. When cats begin to shed the pounds quickly, they often begin to mobilize fat for energy. Unfortunately, the cat’s liver is not very equipped to do this and can become overloaded quickly, resulting in a serious condition called hepatic lipidosis (fatty liver). If your cat is going to go on a diet, keep in mind that she should only be losing about 1-2% of current body weight per week. This may be just a few ounces, so an accurate scale is a must. Please ask us if you need help formulating a safe weight loss plan for your cat. We are happy to help combat cat obesity. You have probably heard that weight loss is all about calories in and calories out. This is true – mostly! Many pet weight issues can be solved by accurately assessing their caloric needs and then feeding accordingly. Simply reducing calories can help tremendously. There are some pets that have trouble maintaining a healthy weight even with exercise and appropriate feeding practices. These pets may suffer from a slow metabolism or even have a medical condition such as hypothyroidism. 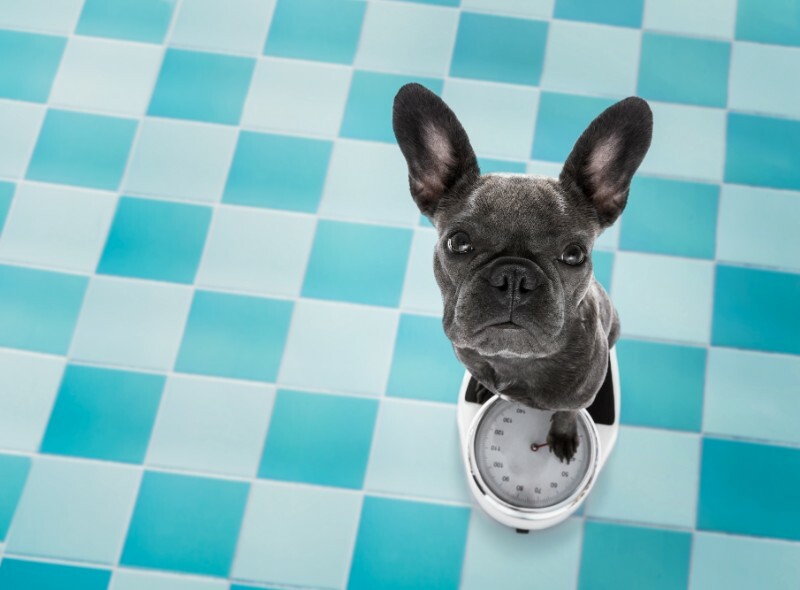 If your pet is gaining weight despite your best efforts, it’s time to bring them in for us to evaluate. Yo-yo dieting is just as damaging for pets as it is for humans. It’s best to go into each winter with a plan to maintain a pet’s healthy weight through the colder months. We know that Illinois winters can be brutal, so this often means decreasing calorie intake (unless your pet will be outdoors a lot) and thinking of creative ways to keep your pet active until the big thaw. It’s a myth that one cup of dog or cat food is equivalent to the next. Foods can vary greatly in calorie content and even their intended purpose. For example a cup of Iams Healthy Naturals Adult Dog food contains 352 kcal per cup while Purina Dog Chow Complete Nutrition Adult Dog Food contains 430 kcal per cup. That’s a big difference for most pets! Many people make the mistake of continuing to feed the same number of cups per day when switching foods, or (gasp), don’t even measure at all. Likewise, it is important for us to know exactly what brand and variety of food your pet is eating for us to make nutrition recommendations. Snap a picture on your phone or even bring the bag/can along with when you come in. Pet weight myths abound and it can be a little difficult to sort through what information is right and what is not. Please don’t hesitate to reach out to us – we are here to coach you through all of your pet nutrition questions! Previous: Should You Be Preparing for Upcoming Pet Events? Yes, Please!